The Fayette County All-N-One 4-H Club members for 2017 are: Front row: Cali Kirkpatrick and Alora Self. Middle row: Garren Walker, Trinity George, Katy Kotlinski, Skylynn Barden and Trinity Hixon. Back row: Anya Matthews, Mary Gerber, Hidy Kirkpatrick, Madison Johnson, Thomas May and Kalila Wilson. Absent were: Abby Arledge, Peyton Johnson, Lorelei King, Lucas King, Gabbie Miller, Victoria Miller, Taylor Perkins and Andrea Robinson. 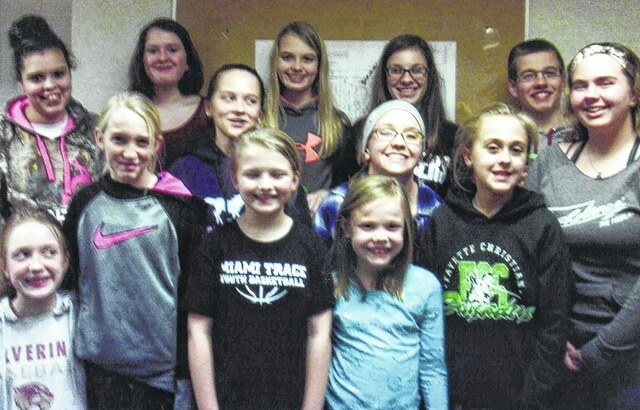 https://www.recordherald.com/wp-content/uploads/sites/27/2017/02/web1_img532.jpgThe Fayette County All-N-One 4-H Club members for 2017 are: Front row: Cali Kirkpatrick and Alora Self. Middle row: Garren Walker, Trinity George, Katy Kotlinski, Skylynn Barden and Trinity Hixon. Back row: Anya Matthews, Mary Gerber, Hidy Kirkpatrick, Madison Johnson, Thomas May and Kalila Wilson. Absent were: Abby Arledge, Peyton Johnson, Lorelei King, Lucas King, Gabbie Miller, Victoria Miller, Taylor Perkins and Andrea Robinson.